Rocky reefs form an important habitat on the continental shelf and are subject to disproportionate fishing pressure given the high productivity of this habitat relative to adjacent sandy seabed. Despite this, little is known of the extent and nature of these systems beyond their value to the fishing industry. This project collates all known mapping data from government and industry (including data acquired during CERF and NERP Hubs) to provide an updated map of this key habitat around Australia, and will identify critical gaps in this knowledge to be filled by targeted surveys. This will significantly improve the knowledge of these environmental assets within state waters and the Commonwealth Marine Area, improve our understanding of assets in marine protected areas and inform environmental assessment of proposed activities and developments required by environmental legislation. Collated information also contributes to development of a blueprint for monitoring key ecological features of the Commonwealth Marine Area. A geomorphological classification system is also being developed for these reefs, and associated cross-shelf habitats with the aim of it being accepted and adopted nationally, and it is being tested and refined for biological applicability. This milestone report documents the major outcomes of a national workshop intended to identify existing shelf-reef datasets, key stakeholders and develop a pathway to sharing our current data holdings nationally, and identifying priority knowledge gaps to prioritise future research projects in this space. 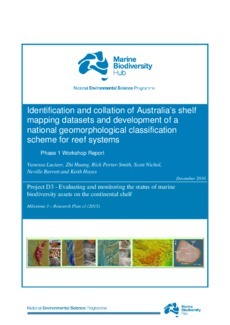 It also documents workshop outcomes focussed on developing a nationally accepted classification for cross-shelf reef systems and associated habitats, and progress made subsequently in refining a scheme suitable for Australian conditions and agencies.